Two down so far! I can’t believe we are already in our third country…time is flying by. We spent most of our time in Cartagena walking around looking at the old town that is surrounded by a wall that is centuries old. 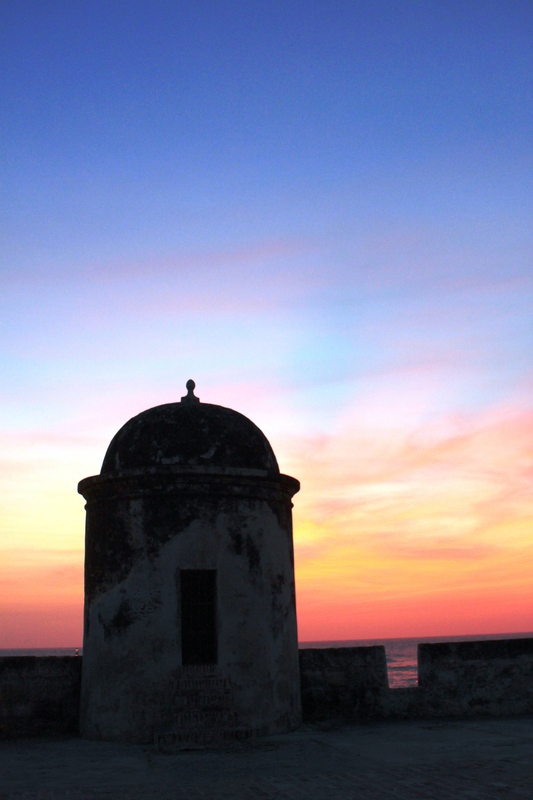 We also ate a lot, walked along the beach, ate some more, went up to Convento de la Popa which is a Catholic church on a hill overlooking all of Cartagena, and spent nights watching the sunset over the Caribbean Sea with a cold drink. It was a nice and relaxing city with a very laid back feel. On the other hand, Bogota was very busy! We saw several museums and got to hang out with our new friends Rafaela and Juan Daniel who showed us a lot of Bogota and the country side. See more about our time in Bogota here. Food: We loved the food in Colombia! I don’t think we had one bad meal. 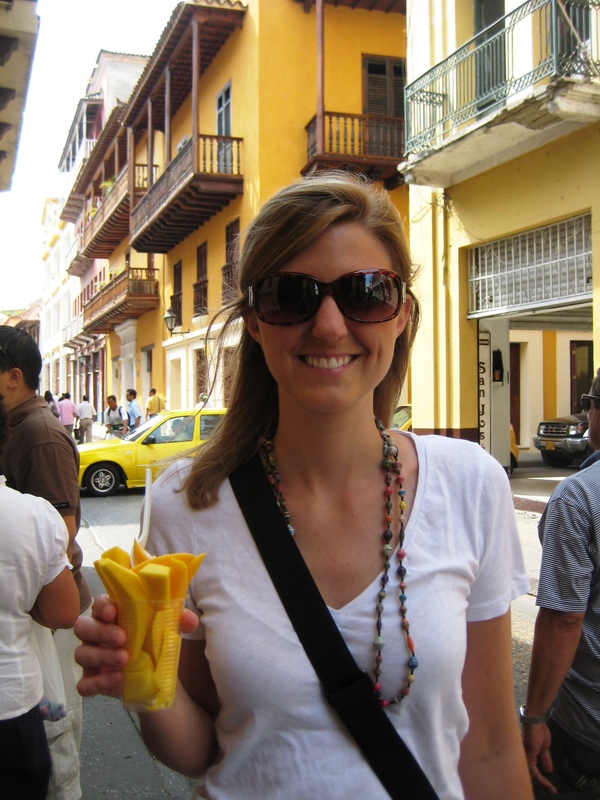 We tried several different things on the street – fried plantains, fried dough, mangos. We ate twice at a place in Bogota called Yumi Yumi which was just down the street from our hostel. Steven had a salmon salad with star fruit that he loved and I really liked both of my meals. Since we had so many good meals, we are going to each give our favorite meal and dessert. Steven’s favorite meal: On the way to the salt cathedral outside of Bogota, we stopped and ate at a local place on the side of the road. The four of us shared a huge plate of varied meats with some potatoes, fried plantain, and more. He wasn’t feeling very well but the food just seemed to hit the spot. Either that meal or the bbq that Luigi cooked for us at his polo farm which included great cooked meat, corn with cheese (a different type of corn than the US, it is more chewy and bigger), and salad. It’s hard to beat a great home cooked meal. 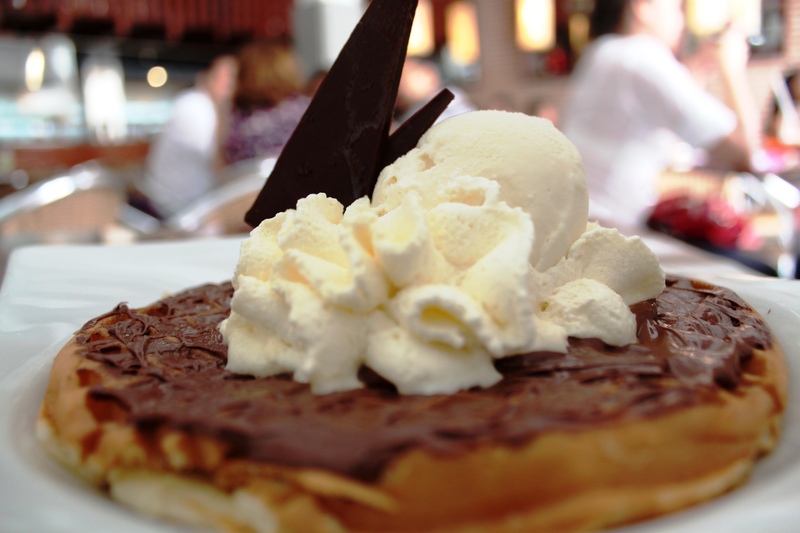 A waffle covered in Nutella, topped with whipped cream and vanilla ice cream - muy excelente! Jen’s favorite meal: Lonely Planet recommended a restaurant called El Bistro in Cartagena so we decided to try it. We split the lomo fino (steak)with mashed potatoes and it was amazing! Jen’s favorite dessert: A chocolate melting cake in a cute little square in Cartagena…doesn’t sound that exciting but it was good! Lodging: Our first night in Cartagena, we stayed in a hostel called Media Luna in a dorm room. It is THE hostel in Cartagena. In the middle of the complex, there is a swimming pool and courtyard filled with lounge chairs and hammocks. Plus, the dorms were great – the way they were built they actually didn’t creak every time someone moved, but at this point, we have learned that we prefer private rooms if that is an option. Furthermore, we were told that Media Luna was in the red light district (although we didn’t venture out to find out) so we decided to move to the old town. We found a private room with private bathroom at a place called Hotel Las Vegas. We had not had a private bathroom since our first night so that was pretty exciting! In Bogota, we stayed at the Platypus Hostel. It was in the La Candelaria part of the city which is older Bogota and a great location close to the museums, government buildings, and is really filled with more history and character than the rest of the city. We had a private room which was nice but the bathrooms were not our favorite! Steven’s top experience: The country side was easily top of the list, and a big part of that was getting the chance to go out to the polo farm. 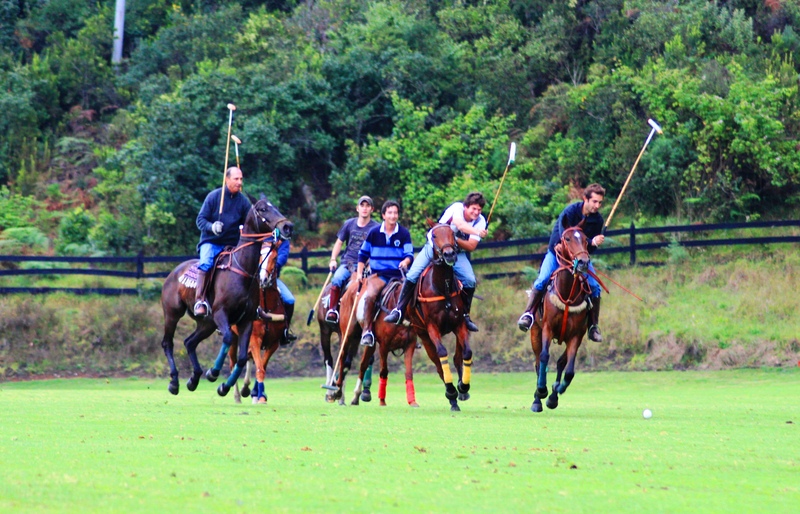 Having never seen polo in person before, it was a great experience getting to watch that guys ride around and play. Not to mention, we then got to go out in the field with the horses and tour around. Then, the best part for Steven was probably talking economics, public policy, and history with the men around the table (particularly Luigi and Nico) who were each heavily involved in their country and well respected public servants. They had an incredible amount of insight and aided in helping him really learn more about Colombia. Jen’s top experience: Too many to choose from! In Cartagena, watching the sunset at Café del Mar on the city wall. It’s beautiful and cool with the wind coming off the ocean which is a nice change from the heat during the day. In Bogota, hanging out with Rafa and Juan Da and seeing the countryside of Colombia. Worst experience: As some of you may know, when I get hungry, I am not very nice. The first day we got to Cartagena, we checked into our hostel and headed to the old town to find some food. It was hot and I was already starving. Steven was being so nice, trying to get us to a restaurant to feed me but I was not feeling great and was not very nice. He practically had to drag me along the streets. But we got food and luckily he forgave me for being a brat! We loved our time in Colombia and were sad to leave (but excited to head to Peru)! Colombia does not have the best reputation as a tourist destination but that should all be changed. After the work of people like President Uribe, Oscar Morales, and millions of Colombians countrywide, it is a much different place than what it was 10 years ago and what is still depicted in the US. We greatly enjoyed experiencing it all, felt safe, and would certainly recommend for anyone to go visit.